and I think, damn! I wanna be Bill. In fact, I like her so much, I wana start a fantasy campaign titled “Jessica for Queen”….. I mean, if the vamp’s are a democracy. 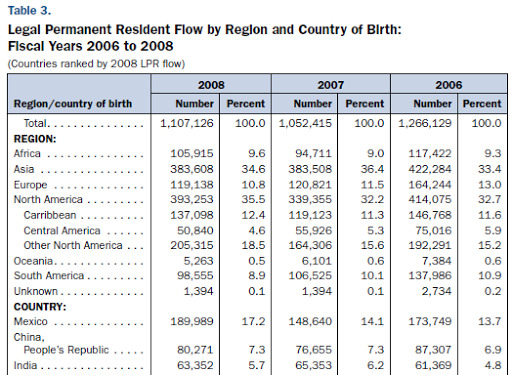 But how do we justify that the ratio of Asian Indian naturalized into the US is somewhere between 1.7 and 1.3 times the number of Chinese from PRC naturalized into the US? 1.7 times is almost twice the number. Consider a simple calculation. suppose that X is the percentage of world’s population that the US would like to have as it’s citizens. Would X * 1.1e9 be less than X * 1.3e9? Instead of being almost twice as much? What the heck am I missing here? As dutiful citizen of the US, I’d like to point out that we might be making a serious mistake here not sampling fairly from the world’s population!! Note that the ratio goes the other way. The legal immigration of Chinese Permanent Residents exceeds that of India to the ratio of 1.4 times as much. So why is it that only 40% of PR of Chinese origin choose to become Americans and as much as 77% of Indian origin choose to be come Americans? Dare I suggest that Chinese are not as competitive? Less adaptive to the Culture of the United States? Too loyal to their indoctrination from Communist upbringing? So, according to this table, the US actually imports 3 times as many Chinese people to work in the US as the number of Indians recruited. However, Indians were more able to bring their relatives into the US by Immediate or family preference Visa’s. So it would appear that Chinese people are being brought over as labor for the American economy and the Indians are just bringing their families over to live. It seems that China contribute more to the American Economy than India, but India contribute more to the USA by way of culture (Slumdog), population, and of course consumers. Overall, I think Indians have a better strategy than Chinese. Slaves and Laborers are really not part of the population until they rebel and live up to human level of quality in life. Then they can even begin to be part of the society. I made an interesting observation with a co-worker today. It would seem that the “short sale” in real estate world can be viewed as a call option for the buyer and a put option for the lender. Short sale takes place when the owner (and eventually seller) does not pay mortgage for 6 months, and bank that loaned him the money to buy this house(the lender) agrees for him to try to sell the house at a price below his loan amount to minimize the bank’s loss (which would have been the entirety of the remaining loan principle minus whatever the house is worth) The missing amount between short sale price and the remaining loan principle is either forgiven or put into a separate payment program which the owner/seller would have to pay over the next few years. This situation, though somewhat painful for the owner, creates a great investment opportunity to a buyer. The conventional wisdom is that short sales are some percentage below market value of the house. So for instance, if the house that is for short sale is worth $100,000 at market value, then it is likely that the lender will allow me to buy it at $80,000, or $75,000, or even $50,000 depending on the market and the house. A buyer, may put in an offer at a price slightly higher than 20% discount (after inspecting the house, of course), say 10% below market. This gives him the advantage over all other buyers who will have made offer assuming 20% to 25% mark down. If all goes well, he will receive an approval from the lender of the short selling owner, typically three months after the offer is accepted by the seller and submitted to the lenders. At that point. the buyer has the option of continuing with the purchase at 15% discount, or making an offer on a different, and presumably better, house at the same price. So, by being involved in a short sale, he creates a call option for himself on an opportunity that may or may not be a good deal. But this choice is almost entirely free. (The offer, cost only fees to a realtor). And often, it is an entirely legitemate reason that bank takes too long or market recovers for buyer to back out of the offer. So it is nearly zero risk and zero cost to the buyer, but the upside is possibly 10% to 20% guaranteed mark-down from market price of a house. This appears to be common practice amongst professional real estate investors and contractors who flip houses. Just today, I saw two houses close within the same week, the short sale being a good 25% larger in square footage, has an additional pool, but identical lot size, right next to each other on the same street (literally xx1 and xx3 on the same side of the street), exactly same age. And the larger home with the pool that is a short sale sold for something like 7% less than the smaller house right next to it. This illustrate an expert use of this technique I describe above. I of course also suffer from the same situation. What I paid for my house, bought a short sale that closed exactly within a week before my closing next block over(1xx vs. 2xx). And that house has twice the square-footage of my house, same lot, 10 years older than my house. The only thing that it does put to question is the professional ethics of my realtor, my seller, my financial agent. Only these people knew of my purchase progress, and only they could have informed that short-seller (or that lender) of my purchase price. I am beginning to wonder about the professional integrity of the people in the real estate business in the San Francisco Bay Area…. America is such a wonderful country. It’s so vibrantly full of life and cultures. Today, somebody blanked my computer screen while I tried to work. because I know that previously, some people with advanced hacking skills will hack into my computer and blink my screen or screw with things on Jewish holidays so that I stop working and observe it with them. For some reason, my company is gaining Indian population at an alarming rate. Nope, nothing Indian today… And plus we aren’t competing or anything, so it makes no sense for them to mess with my computer. I said to google, and google said “nope”, today is not a Christian holiday either. Man, I feel so ignorant. Oh, and the Muslims. That’s the people who believe in Islam a religion, as far as we’re taught in America, that is essentially an organized terrorist organization. Oh, and Koreans, Man! America is so complicated… Has Koreans invented a saint of some kind after their separation from Chinese culture that I don’t know about? Which of you deities have I offended today that causes my screen to blank every time I’m about to type a command into my console? what kind of animal sacrifice must I make to appease you? Can I light some fireworks on July 4th? Does that count?? ?